Founder of the universal language "Esperanto"; born at Byelostok in Dec., 1859. His father, Markus Zamenhof, and his grandfather, Fabian Zamenhof, were teachers of French and German, the latter being the pioneer of general culture among the Jews of Byelostok. In 1873 Markus Zamenhof removed to Warsaw, where he became professor of German, first at the Veterinary Institute, and subsequently at the real-gymnasium. He was one of the three Jews of his time who held such an official appointment, and he became a state councilor. 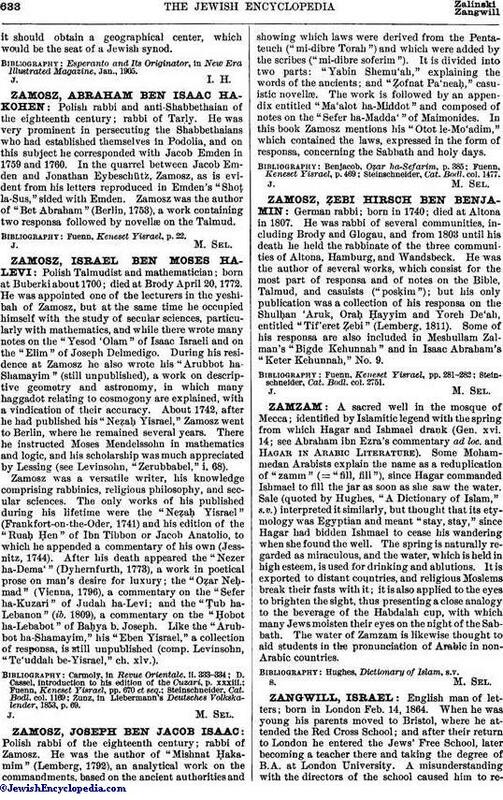 He compiled many text-books, and was the author of a rabbinical phrase-book in Hebrew (i., Warsaw, 1905) and a polyglot phrase-book (i., ib. 1905). Zamenhof pursued general medical studies at Warsaw and Moscow (M.D. 1884), and settled in Warsaw as an oculist. He later practised at Kherson and Grodno, but in 1897 returned to Warsaw, where he now (1905) practises among the poorer Jews. Zamenhof's reputation is due to the fact that he is the founder of Esperanto, the new universal language which has taken the place of Volapük. The idea of an international form of speech was suggested to him by the polyglot character of his native town; four different languages were spoken there, and to this fact he attributed the constant dissensions and misunderstandings which disturbed the city. In the gymnasium and at the university he threw himself heart and soul into the study of languages while pursuing his medical work; but the idea of Esperanto did not dawn on him at once. At one time he entertained the idea of mathematical construction, and later the claim of the dead languages, especially Hebrew, appealed to him. For three years he worked at Yiddish and compiled a grammar which is still unpublished, hoping that, since Judæo-German was a modern tongue in use among millions of his coreligionists, it might be universalized. Discarding this idea in its turn, he finally reached the conclusion that no language could ever become a universal medium of communication if it identified itself with any individual nationality or country; it must be neutral. In 1878 he succeeded in building up such a language on the basis of the Romance and Teutonic roots of modern European tongues, but it was not until 1887 that, after several unsuccessful attempts to find a publisher, he gave to the world his first brochure, published anonymously under the pen-name of "Doktoro Esperanto" (Dr. Hopeful). The success of his pamphlet was immediate, and from that time to the present Esperanto has steadily increased in popularity. In the following year the Volapük Society at Nuremberg ceased to exist, and its place was taken by the first Esperanto club. In 1891 a second club was founded at Upsala, in Sweden; St. Petersburg followed, with branches at Odessa and in Siberia; France and Denmark joined the movement in 1897; and Brussels and Stockholm were included in the following year. The first Esperantist group in Paris was started in 1900, and the next year Esperanto made its first official appearance on American soil in the city of Montreal. Since then associations for its study have been founded in all parts of the world. There are now about 120 societies in existence, and the language is spoken by at least 200,000 persons. At the St. Louis Exposition it was accorded official recognition by the French sectional committee. There is a large and constantly increasing literature in Esperanto, and more than twenty journals are in circulation, including a braille monthly magazine for the blind, a Roman Catholic organ, a Socialist paper, and an "International Scientific Review." Two plays of Shakespeare, "Hamlet" and "The Tempest," have been rendered into Esperanto, the former by Zamenhof himself; and the language is also coming into commercial use. In compiling his universal language Zamenhof appears to have regarded primarily the needs of his Yiddish-speaking coreligionists, whom he has described as "speechless, and therefore without hope of culture, scattered over the world, and hence unable to understand one another, obliged to take their culture from strange and hostile sources." 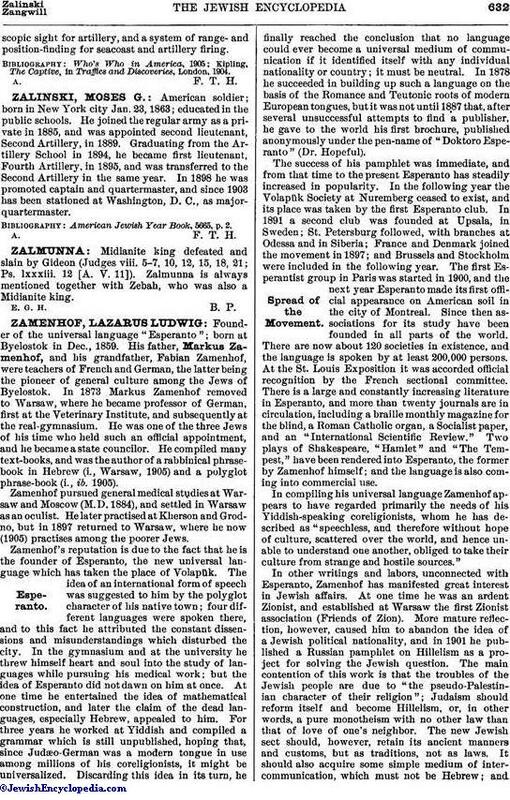 In other writings and labors, unconnected with Esperanto, Zamenhof has manifested great interest in Jewish affairs. At one time he was an ardent Zionist, and established at Warsaw the first Zionist association (Friends of Zion). More mature reflection, however, caused him to abandon the idea of a Jewish political nationality, and in 1901 he published a Russian pamphlet on Hillelism as a project for solving the Jewish question. The main contention of this work is that the troubles of the Jewish people are due to "the pseudo-Palestinian character of their religion"; Judaism should reform itself and become Hillelism, or, in other words, a pure monotheism with no other law than that of love of one's neighbor. The new Jewish sect should, however, retain its ancient manners and customs, but as traditions, not as laws. It should also acquire some simple medium of intercommunication, which must not be Hebrew; andit should obtain a geographical center, which would be the seat of a Jewish synod. Esperanto and Its Originator, in New Era Illustrated Magazine, Jan., 1905.